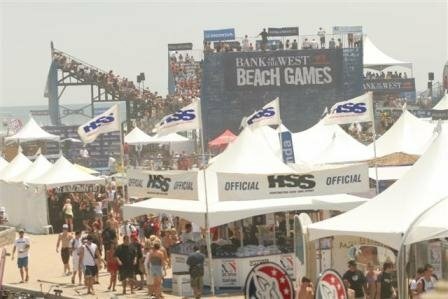 This past weekend I had the privilege of attending the U.S. Open of Surfing in Huntington Beach. It was sick! The US Open is the highest rated qualifying surf event for men and women in North America. It’s also the most heavily attended (you can imagine what this does to parking on my street). This year the U.S. Open went hand in hand with the Beach Games (do they always? I don’t know). 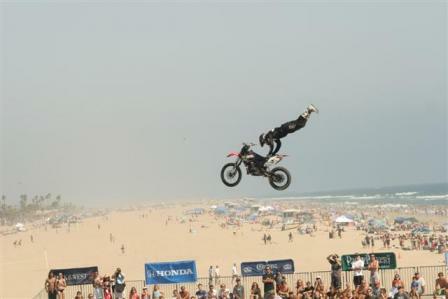 The Beach Games featured skateboarding, BMX, FMX and beach volleyball. I was hoping to get some interview time with some of the greats like Kelly Slater, Andy Irons, and Rob Machado, but to no avail. Kelly Slater and Andy Irons didn’t even compete (WTF?) and Rob entered the competition late and surfed the early morning heats (and who expects me to get up at 8:00am to see those?). But overall, the whole weekend was great. Sofia Mulanovich won the women’s open. She surfed amazingly, and the Americans loved her accent. Rob Machado rocked it, coming out on top after losing last year in a close final with Andy Irons. Roy Powers came in second, much to the dismay of many of the ladies (who don’t care how well he can surf, just that he looks pretty doing it [not that he can’t surf]). To get a feel for how things went, I have included some of the highlights of the weekend, and some things that overshadowed the games. 1. Getting hooked up with VIP passes (in a way which didn’t involve sleeping with powerful men) . These things were like gold. Most of the athletes couldn’t even go where we went. We spent parts of the day in the Surfer’s lounge drinking Sobes and eating some new brand of chip that some moto x guy just came out with. 2. The O’Neill Tow At aerial demonstration. Several of the best “radical surfers” were there, being towed by jet skis, which launched them into insane maneuvers. Also, watching that one dude surf right through the pier. That was crazy. 3. Sitting at the beach for hours, soaking up the sun and watching the sports (and probably getting cancer). 4. Watching the Grand Master skate-off at the Soul Bowl. 5. Meeting skaters, surfers, FMX and BMXers who’s names I don’t know and really don’t care about. 6. Seeing the Huckin Chicken (Jeff “Ox” Kargola) in action! woohoo! I had that Burger King Huckin Chicken song in my head the entire weekend. Which was annoying for everyone considering I don’t know any words except for “big huckin chicken”. I barely know the tune. There were a few things that I felt overshadowed the games. Here they are in all their (non) glory. 1. The shameless amount of promotions EVERYWHERE. Granted, from an advertising perspective, this was brilliant. There were tents all over the beach which offered free stuff–hats, wristbands, airbrush tattoos, keychains, drinks, etc. Everyone on the beach became billboards and bumperstickers. Hot girls wearing practically nothing, with O’Neill airbrushed across their stomachs? You know people are looking at that! Attractive men wearing Corona hats? Beer never sounded so good! Genius! It made me want to puke. Until I got my pink Tonik senorita trucker hat that I am completely in love with. But, hey, at least I’m representing health insurance! Wow, this sounds serious. The constant use of the words secret machine was leading me to believe this was some big crazy joke or publicity stunt. I mean “secret machine”? “disturbing”? Is it the last days? I asked some protestors “what’s the machine?” and they couldn’t even answer me. They had no clue! All they did was hand me a flyer and tell me to read the second paragraph (because they had no clue!). I finally found something that alluded to what the secret machine was/does. “An advanced, machine-generated light and sound experience“. Ahhhh. Okay. So…to sum up, after extensive research, I’ve come to the conclusion that the only people who even care or understand (care) what this is about are a few surfers (obviously not the ones in the film) and filmmakers (obviously not the ones who made it). I would probably totally care if someone would actually explain it to me. Thanks for almost ruining my weekend by making me do research.